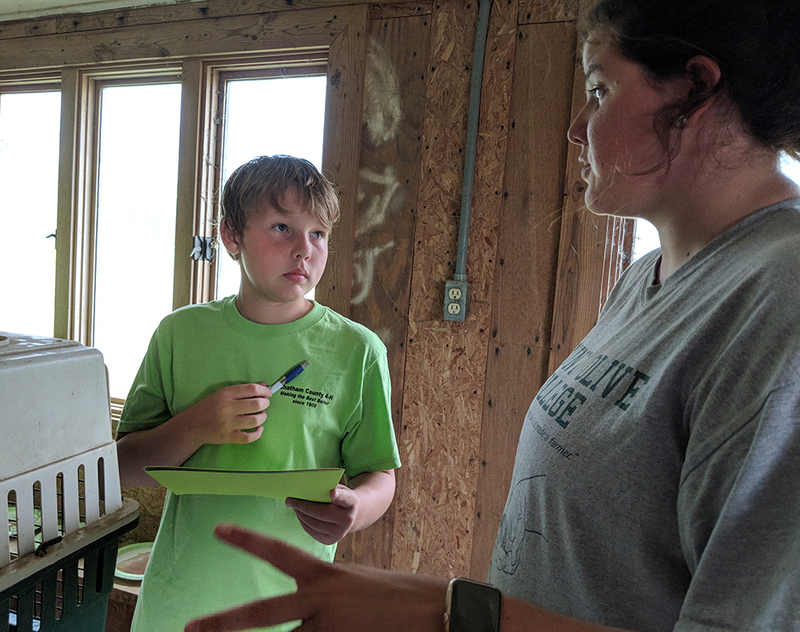 Last summer Dan Campeau, North Carolina Cooperative Extension Area Specialized Poultry Agent, formed a new 4-H Poultry Judging Team called the Chatham County Peeps. The team members were kids ages 12-15 and most of them had known each other since they were in pre-school. All were animal lovers but none had direct experience with chickens. Dan presented them with an opportunity to train for a state competition and they accepted the challenge. No one could predict that they would go on to win FIRST PLACE at the state competition and win a trip to compete at the national competition in Kentucky! 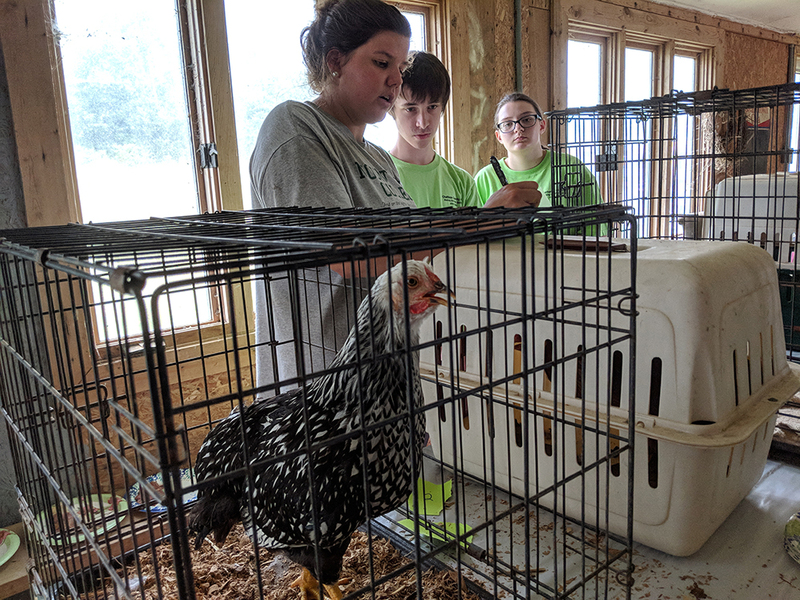 So…what is a Poultry Judging Team and what does the competition involve? 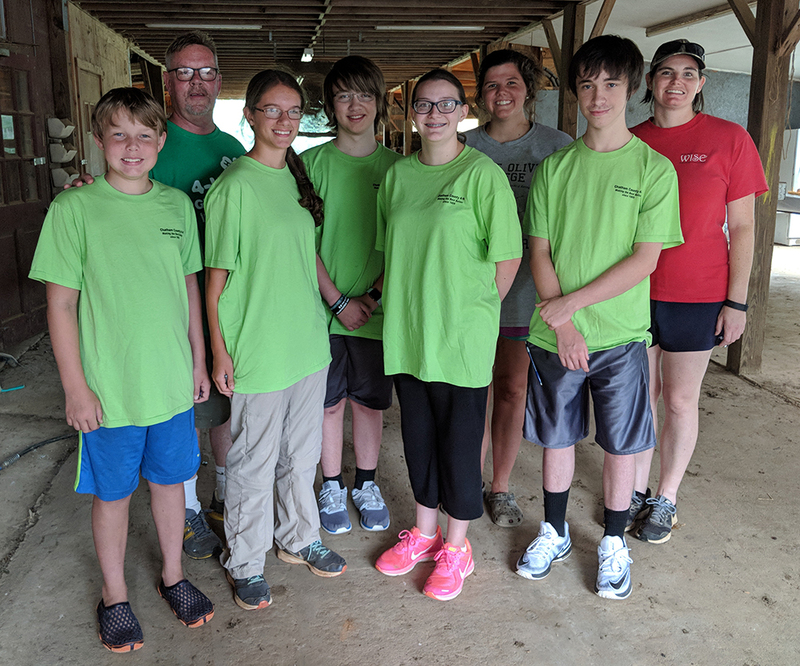 The team included several local youths: Samantha Andrews (15 years old), Emily Stecher (14 years old), and Gage Lindley (15 years old) – these three comprised the Senior Team. Tristin Elkins (13 years old) and Kole White (12 years old) were on the Junior Team. Victoria Brewer (N.C. Cooperative Extension of Chatham County Administrative Assistant) and intern Emma Wicker helped Dan coach the teams. Lori Andrews and Kim Lindley served as project leaders. The teams spent five weeks training for the state competition, meeting every week to learn a different skill that they would need to demonstrate at the state competition. 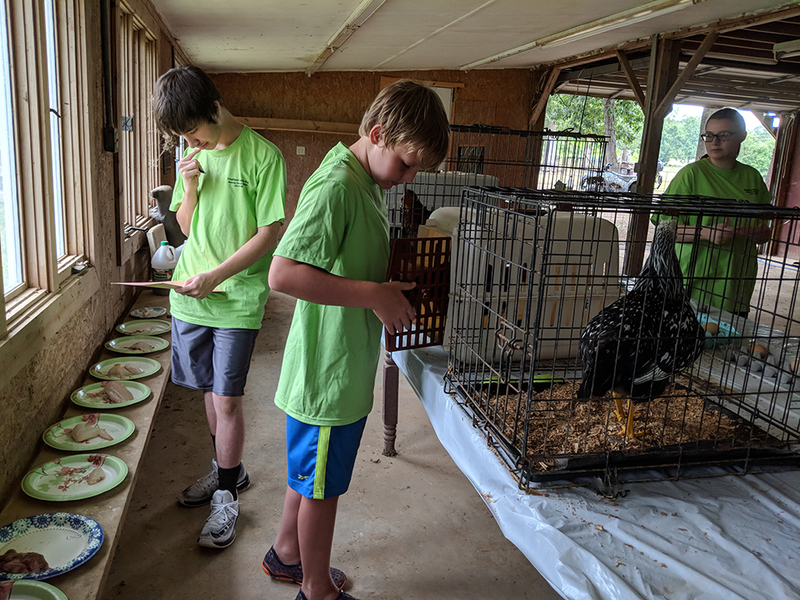 They learned to judge live birds, candle eggs, grade eggs (interior and exterior quality) and ready-to-cook chickens, and identify cut chicken parts. Each team member had to also go before the judges and explain how they ranked the live birds they evaluated. The final training was a mock competition where they put it all together. Everyone was shocked when the Senior Team won first place at the NC State 4-H Poultry Judging Contest held in Raleigh in July. This was their first time competing and they competed against other more experienced teams! After winning the state contest, the Senior Team won a free trip to Louisville, Kentucky for the National 4-H Poultry & Egg Conference in November. They came in 13th place out of 25 teams! 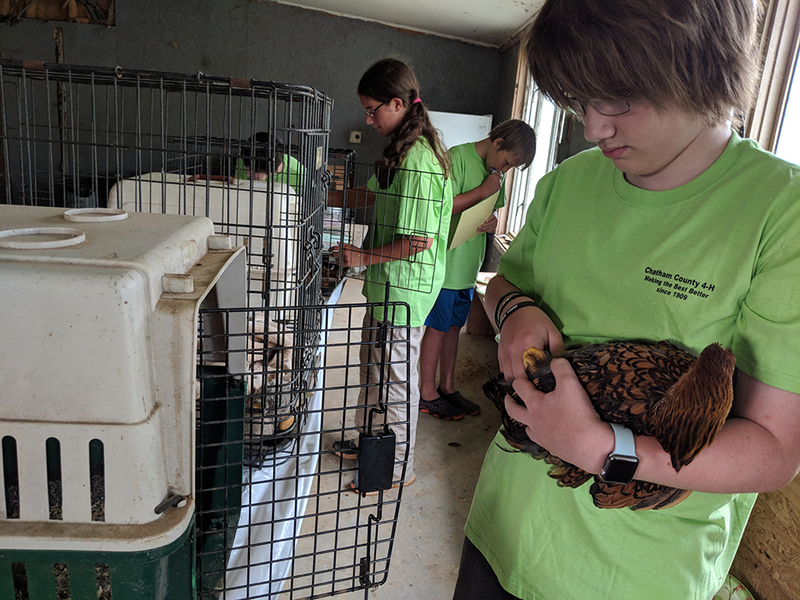 Team Leader Lori Andrews said it was amazing to watch the transformation of the kids who had never handled chickens as they stood in front of judges with no notes to share their knowledge. This experience gave them confidence and will help them in high school and college. Everyone was so proud of all the team members! Most of the photos below are of the mock competition that was held right before the state contest. There are too many photos to fit on one page so make sure you click on the link at the bottom to see Part 2! Chatham County Peeps, from left to right: Kole White, Poultry Agent and Coach Dan Campeau, Emily Stecher, Gage Lindley, Samantha Andrews, Coach Emma Wicker, Tristin Elkins, and Coach Victoria Brewer. Photo by Debbie Roos. Gage is judging a live bird. None of the team members had ever held a chicken before training for this competition! Victoria provided the chickens for the training. Photo by Debbie Roos. 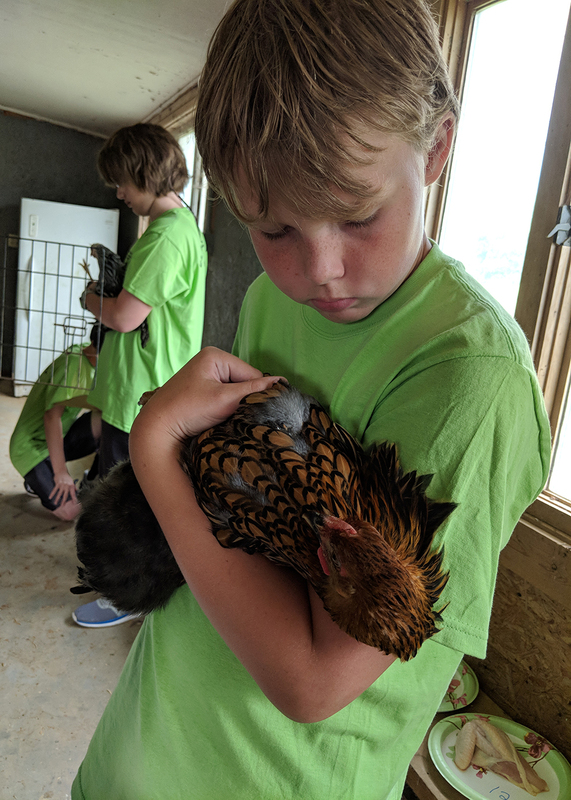 Gage is checking the abdominal capacity of this hen by using his fingers to measure the width of the area between the pubic bones. He then measures the distance between pubic bones and the keel bone (the breast bone). He uses these measurements to calculate the abdominal capacity. The more eggs a hen has produced the greater her abdominal capacity. Photo by Debbie Roos. 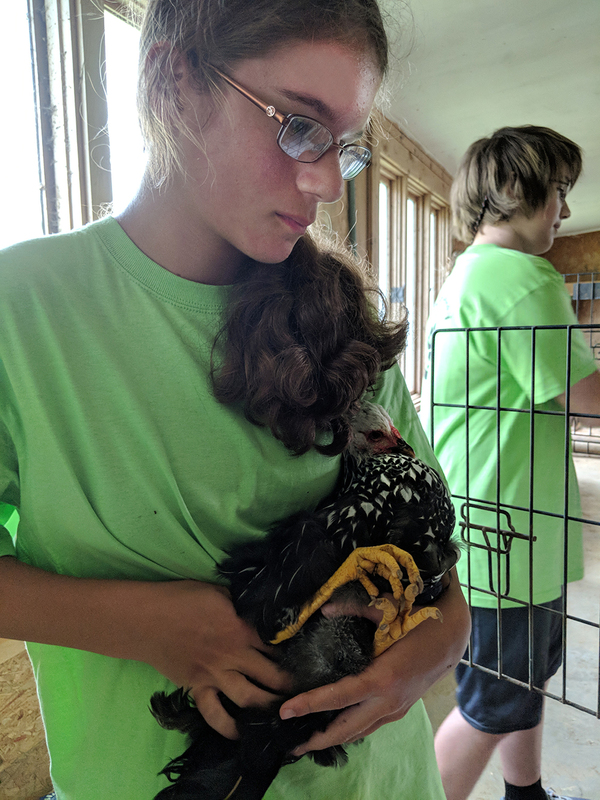 Emily is examining this pullet (a young hen that has not produced eggs) to assess how soon she might start laying eggs. She is also looking at skin color on the legs: the lighter the skin color on the legs, the more eggs they have laid. 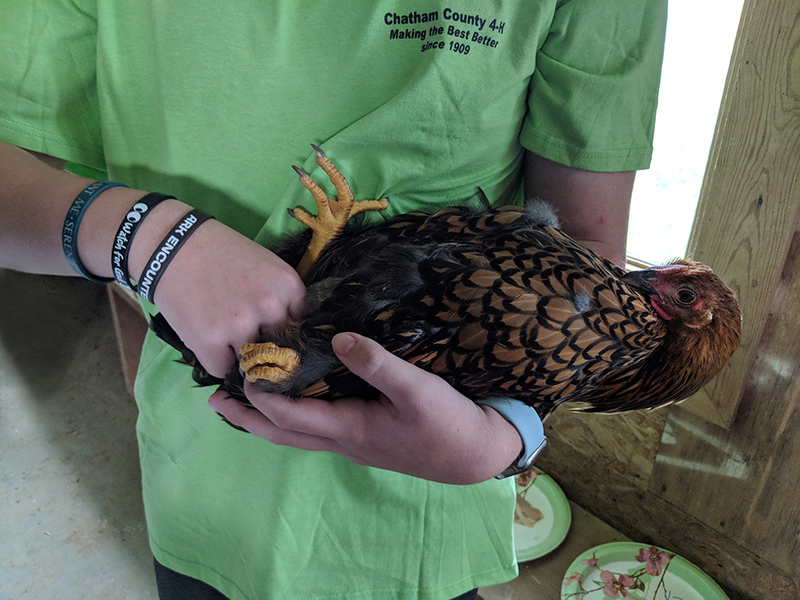 The legs are bright yellow now because this is a pullet and has never laid eggs. Emily is comparing four birds against each other and has to pick which one is the closest to egg production and explain the reasoning for her selection. 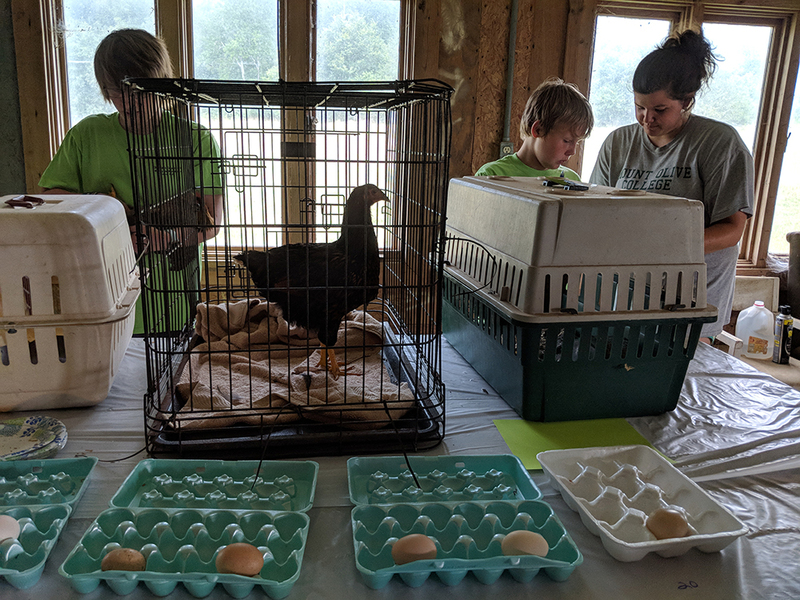 In the real contest they will be assessing hens that have produced eggs and have to determine which hen has laid the most eggs over her lifetime. Photo by Debbie Roos. Practicing with the live birds. Photo by Debbie Roos. Emma and Kole are discussing his evaluation of the live birds. Photo by Debbie Roos. Kole is evaluating a live bird. Photo by Debbie Roos. Tristin is identifying chicken parts while Kole prepares to evaluate a chicken. Photo by Debbie Roos. Emma is going over answer sheets with Tristin and Samantha. Photo by Debbie Roos. Working hard! Photo by Debbie Roos. 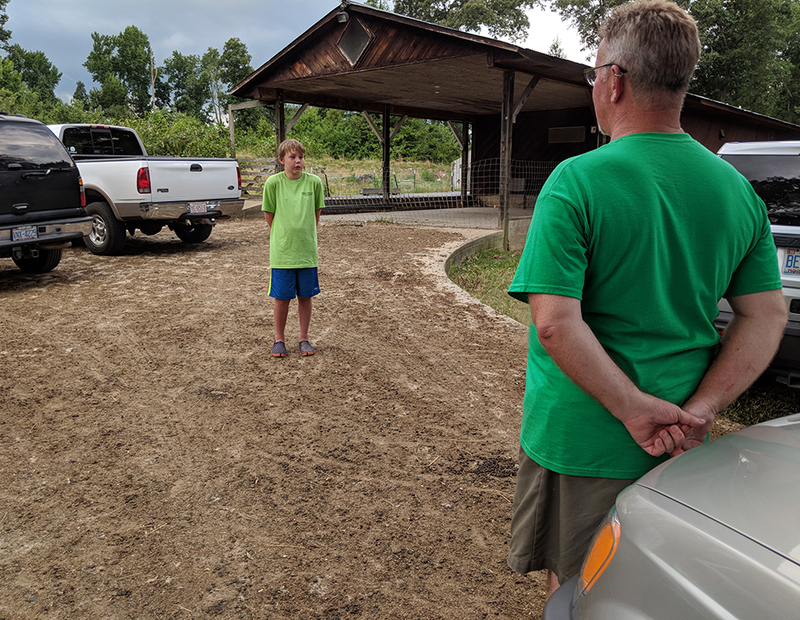 Kole is practicing his oral presentation with Dan, giving reasons why he chose the birds he did in the live bird evaluation. He had to select first through fourth place and justify his rankings. Photo by Debbie Roos. • Don't Wash Your Chicken! 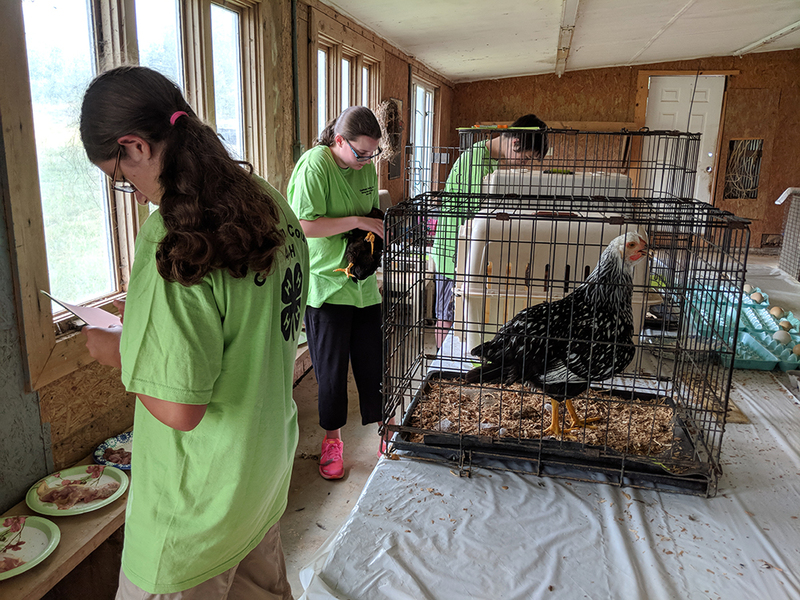 • 2018 Martin County 4-H Poultry Chain - Huge Success!